Patra's Other Place: The second birthday party and a special guest. As I wrote in the previous post, Ken's sister hosted a birthday party at her home today for their Mum, so the rest of the family could come and see her. MIL's two children (Ken and SIL and spouses), SIL's three children and partners, and four of their children were there (four generations) as well as some cousins and other rellies. The highlight of the afternoon was a visit from a friend of Ken's - Red Horse, who is a Native American married to an Aussie and living here. 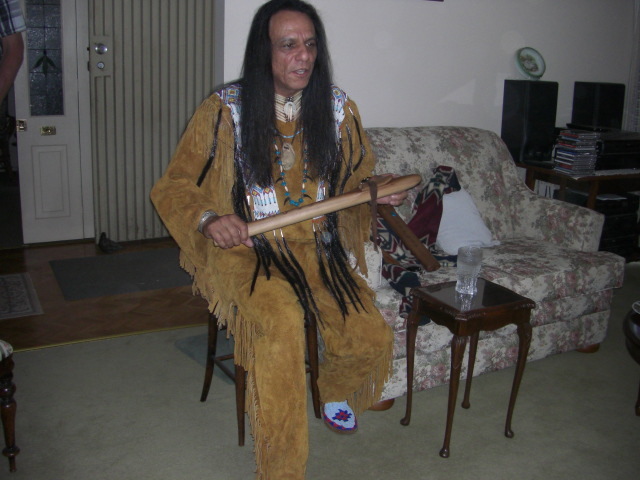 He is an Apache Indian, and holds workshops and seminars to teach people about the Indian culture. Ken and his Mum have both long been interested in American Indians, and when Ken told Red Horse recently she was 99 years old, he said he'd love to meet her, as the Indians have great respect for their elders, and not many of them get to that age. Ken asked his sister if she'd mind, and she said not at all, she would be delighted to meet him, so Red Horse promised to arrive about 2.30 pm. He arrived on time in traditional regalia - beaded deerhide jacket, pants and moccasins. He was chuckling as he came in, because people driving past who saw him get out of his car, did a double take at the sight of him! We hadn't told anyone he was coming, so it was a complete surprise, and everyone was excited about meeting him. We introduced him to MIL, and she was entranced. Her eyesight is not good, but she can still see well enough to make out peoples' faces and clothes, and her hearing is excellent. 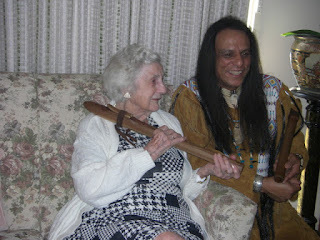 He chatted to her for a while, then played three melodies on hand carved flutes, explaining what each song was about. Cameras, I-phones and I-pads were whipped out and operating for the whole time he was there! Everyone noticed MIL - she sat completely still, apart from tapping her fingers in time to his music, gazing at Red Horse with tears in her eyes. There was such a strong connection that everyone in the room could feel it, and afterwards she said when he took her hand, she felt such a bond as if she had known him forever. I told her she probably has, in previous lives, and she agreed. Ken's nephew has put his video on YouTube, so you can watch Red Horse there if you wish. Great photo of the Birthday Girl and Red Horse. Now you will need to start planning for the big 100. Happy Birthday to your MIL and let us hope she makes it to the 100 mark. I was able to attend a birthday party in toronto for a friend of my sisters whose Father hit the 100 mark. He was sharp as ever and played cards and cribbage with all his grands, greats, etc. Walter actually lived to 104. I said how often do you get the chance to go to a 100th. party. My only one so far. lovely cloth you bought for her. And what a special guest and how the birthday girl enjoyed meeting and listening to him. What a treat for all. Thanks for your comments and I am glad you enjoyed the Seniors. I also hate the new meaning of gay - such a nice word spoiled.